instant pizza bombs | bread pizza bombs | pizza bombs recipe with step wise pictorial and video method. instant pizza bombs | bread pizza bombs | pizza bombs is something your children can do anything for. You can make them dance on your directions once you promise to add these instant pizza bombs in their morning tiffin. though this is not the traditional recipe of pizza bombs and that needs lot of time and efforts. you have to knead the flour with yeast and wait for the fermentation for hours together, making the pizza bombs and then bake. And if you are planning to make pizza bombs in this way only, then forget that you can ever give them to your kids in tiffins. There’s not much time in the morning for all this. Or the best you can do is to bake them at night and add to the tiffin in the morning, though this is not a healthy option. 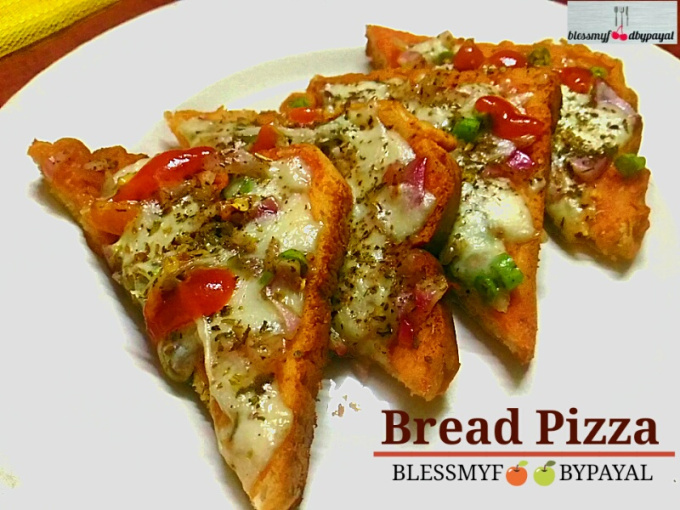 Also have a look at pizza recipe, bread pizza pakoda and bread pizza recipe in this blog. Made with bread, stuffed with cheese & cooked in few drops of oil, instant pizza bombs are something explosive in taste. roughly but finely tear the bread slices in a bowl. add mixed herbs and salt in it. Mix well. now add curd and mix again. make a dough with the help of water but be very careful while adding water. You just need a spoon or two in making a dough. Cover the dough. Keep aside. take a small bowl and add roughly chopped capsicum & grated carrots. add pizza sauce and salt (don't forget that your dough & pizza sauce too has salt. So be careful) and mix well. Add grated mozzarella cheese and mix. Keep aside. With the help of your finger tip, make a hole in the center of the ball and gently dig it by revolving the ball. (For better understanding, please look at the video). Fill the stuffing in the hole with the help of spoon and close the hole by bringing the dough close from all the sides. Again roll the ball between your palms. If you find difficulty in rolling the balls, slightly wet your palm with water and then roll the ball. the ball will get rolled conveniently. With the same method, finish the entire dough and make balls and place them in a separate plate. With this much dough, we could make only 8 balls. Place appe pan* on gas stove on low heat. Add 2 to 3 drops of oil in each cavity. Place each ball in each cavity. Drop 1 to 2 drops of oil over the balls too. Cover the appe pan and let the balls cook. After 1-2 minutes, do check your balls. They must not get burnt. Likewise keep cooking your balls from all the sides until they turn golden brown. This whole process may take 4 to 5 minutes. Take them out in a serving plate and serve hot with tomato ketchup. 1. roughly but finely tear the bread slices in a bowl. 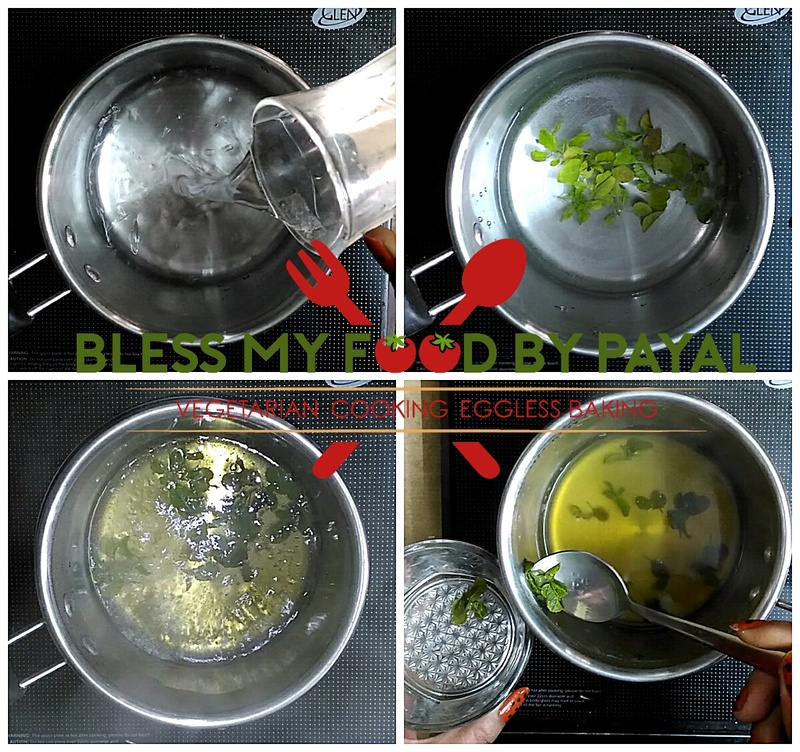 2. add mixed herbs and salt in it. Mix well. 3. now add curd and mix again. 4. make a dough with the help of water but be very careful while adding water. You just need a spoon or two in making a dough. 5. Cover the dough. Keep aside. 1. take a small bowl and add roughly chopped capsicum & grated carrots. 2. add pizza sauce and salt (don’t forget that your dough & pizza sauce too has salt. So be careful) and mix well. 3. Add grated mozzarella cheese and mix. Keep aside. 2. With the help of your finger tip, make a hole in the center of the ball and gently dig it by revolving the ball. (For better understanding, please look at the video). 3. Fill the stuffing in the hole with the help of spoon and close the hole by bringing the dough close from all the sides. 4. Again roll the ball between your palms. If you find difficulty in rolling the balls, slightly wet your palm with water and then roll the ball. the ball will get rolled conveniently. 5. With the same method, finish the entire dough and make balls and place them in a separate plate. With this much dough, we could make only 8 balls. 6. Place appe pan* on gas stove on low heat. 7. Add 2 to 3 drops of oil in each cavity. 8. Place each ball in each cavity. 9. Drop 1 to 2 drops of oil over the balls too. 10. Cover the appe pan and let the balls cook. 11. After 1-2 minutes, do check your balls. They must not get burnt. 12. Likewise keep cooking your balls from all the sides until they turn golden brown. This whole process may take 4 to 5 minutes. * You can also make outer layer by using second method. Take a whole bread slice, cut its edges, roll with the help of rolling pin, put the stuffing in the middle of bread, hold all sides together and toll the bread between your palms. On the other hand you can also slightly wet the bread slice and then roll it by adding stuffing like many of us do the same for making bread rolls. We didn’t prefer this method because we didn’t want to waste the edges of bread. Though you can make breadcrumbs out of these unused edges, but we weren’t interested in breadcrumbs at that time. We were already have them in bulk. * For making stuffing, you don’t require to follow the given ingredients strictly. You can play with your imagination. However cheese is definitely there as we are making ‘pizza’ bombs. * If you don’t have pizza sauce, you can replace it with tomato ketchup. But in such a situation, you need to add more spices in your stuffing. We have added just *salt* in the name of spices because pizza sauce already contains so much of flavors. Add the spices as per your preference and liking. * While taking a dough for making a ball, do keep in your mind that the size of your pizza bomb shouldn’t be more than the size of appe pan’s cavity. If your balls will be bigger than the size of cavity, instant pizza bombs may not get cooked properly. * Also don’t overfill the balls with so much of stuffing otherwise balls with not be able to come together for proper binding. This improper binding is not much problematic in case of appe pan but if you are frying these instant pizza bombs, they are definitely going to burst and spread in oil, destroying instant pizza bombs, oil and as well as your mood too. * As already mentioned, these instant pizza bombs can be fried in case you don’t own an appe pan. But handle them gently while frying otherwise they may break in the middle of oil. * If entire dough is finished but still some of the stuffing is left, you can use that stuffing in making paratha or sandwich.